“Issues with the cleaning and sterilization of medical equipment, as well as infection prevention and control, were identified in the East Central Health Region in March 2007. Dave Hancock, Minister of Health and Wellness, immediately ordered an investigation of the situation by the Health Quality Council of Alberta, and a review of infection prevention and control policies, practices and procedures province-wide. The findings of both reports indicated a need for provincial infection prevention and control standards for all facilities providing health care services. Our practice continually strives to meet the highest level of standards and cleanliness. We took proactive steps in the summer of 2011 and invested $100,000 to update our sterilization centre and instrument delivery protocols before the new regulations came into effect in January 2012. The Health Protection Branch of the Alberta Government and the Alberta Dental Association gave a thorough inspection of our upgrade and we passed with positive feedback. State of the art A-dec SteriCenter installed at Higson Dental Group in Grande Prairie. Single use devices for products that come into direct contact with a patient’s mouth, (ie: needle tips or the tips of irrigation and drying hoses). Sterilize all instruments and disinfect all surfaces (including lights and chairs) between every patient. Ongoing equipment cleaning and disinfecting, as well as checks and tests on all dental devices to make sure we meet provincial standards. Daily biological spore test on sterilizers, and each load is monitored by mechanical and chemical testing. 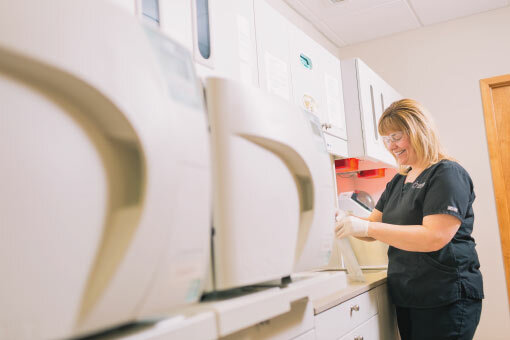 All instrument cassettes are inspected by hand and identified with a sterilization load number, date and time. Each sterilization bag and cassette is identified with two different levels of process indicators to verify their state. Our dentists and hygienists wear masks, glasses and fresh rubber gloves with each patient. Before every visit, our clinical team reviews each patient’s health history. Because some contagions are not present at early onset, we take the same precautions with every patient to help minimize the spread of infection. Infection control is of utmost importance at Higson Dental Group. Our practice is a shared space between staff and patients and we want to ensure every person feels safe and protected. Our team is well trained and vigilant on implementing current sterilization standards and policies. The best way to prevent the spread of disease is to be informed and educated. Our team can help answer any questions you may have. We will gladly provide you with a tour and demonstration of our sterilization centre to further ease any concerns. If you’d like more detailed information about infection control and provincial standards visit: Alberta Dental Association & College.